The learning never stops! Attendees maximized their time in the Exhibit Hall by stopping by the Presentation Area for informal & informative 20-minute updates on new products and services. What Does 20 Years of Excellence Look Like? NASFAA’s Standards of Excellence (SOE) Review Program has helped over 240 schools remain in compliance with the Title IV rules and regulations. Learn what an SOE review entails and why having one will benefit your school. More and more of your campus’ resources are being gobbled up in the form of financial aid. What’s the best way to use your limited pool of resources? Let’s walk through an eight-step program that will help your families understand the financial aid process from the prospect stage through graduation and will help you use your resources most effectively. Many schools fear program reviews, but you don’t have to. Learn about the types of reviews, potential triggers for being selected for a review, the financial ramifications, and more. You’ve been asked a question about professional judgment and you don’t know where to look. Is it in the regulations? Is that an area that is regulated? With the Student Aid Index, the answer is right in the palm of your hand. Also, find out how NASFAA can help you keep all of your policies and procedures in one place, safely and securely with the P&P Builder. Never worry about losing your P&P manual again! Innovating the way financial aid processes are presented is a challenge. How do you make gathering information easy and intuitive? How do you deliver the experience students expect? We’re always looking for ways to uncomplicate financial aid and we’re excited to share the additions and enhancements that we’ve added to our Financial Aid Management Solutions. Join us to hear about new innovations in our universal sign in student portal, award letters and electronic forms as well as enhancements to our current solutions that will help you boost enrollment, promote your school, enhance the student experience and save you time." Join us to learn more about Jenzabar Financial Aid, the cloud-based solution that lets you spend more time with students and meets the needs of modern financial aid professionals – from traditional and CBE programs to multiple awarding methodologies. Are student debt letters the next big thing? They've been mandated in numerous states. Whether your school is facing compliance or you're just curious, stop by to learn how these annual check-ups can help students achieve better outcomes. We'll also share insights and best practices to help you implement a student debt letter on your campus. Ever wondered what consulting is like? At FAS, our culture is client-centered. We earn our clients’ trust and confidence by providing quality service and truly caring about their results. Our values define how we conduct our business and treat all our constituents. Come and hear firsthand what it’s like to consult with FAS. 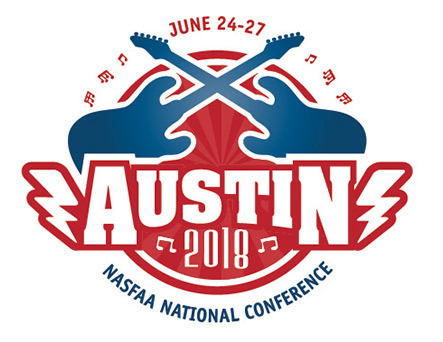 Senior consultant, and former NASFAA National Chair, Judy Schneider, will share how consulting can be professionally challenging and personally fulfilling. Judy will offer personal experiences serving in interim leadership roles, assessing the effectiveness of financial aid offices and providing consulting and guidance to colleagues throughout the country. Institutions across the country are grappling with declining enrollments, while at the same time wrestling with a renewed focus on cost and student outcomes. As institutions develop strategies to address these issues, many are exploring ways to expand online learning and offer more flexible non-traditional enrollment models such as competency-based and self-paced learning. This session will provide participants with an understanding of these new enrollment models, the financial aid management issues and challenges institutions face with them, and how Regent Education works to successfully implement these flexible programs. More than 3 million students drop out of higher education each year due to financial constraints. The top three gaps that claim them? Inefficient financial aid processing systems, poor student communication, and poor organization of scholarships. Bridge these gaps with CampusLogic. Our easy, mobile, personalized student financial services platform drives enrollment and retention and provides the best student experience. We’ll help you streamline financial aid forms and processes, student communications, scholarship management and more. Are you concerned about rapidly increasing student debt levels? Are you looking for solutions to present to your students that can assist them with managing their federal and private student loan debt and possibly reduce their total repayment costs and reduce default rates? If these are issues you and your students face, refinancing can help! We will provide a primer on how student loan refinancing works. We will dispel the myths surrounding these products and provide you with counseling tools which you can use to advise your graduates so they can determine if refinancing is right for them. "Credit invisible" students with a limited credit history and no access to a creditworthy cosigner are among the most vulnerable when lacking the financial resources to pay for their education. Many of these often high-performing students need more money than the federal government will provide. International students have even fewer options. What are the best solutions to provide these promising students who are struggling to pay for their education, yet are often shut out from traditional options? Kevin McNamara, Director of University Relations at MPOWER Financing, and Dennis Wentworth, VP of Business Development at Goal Structured Solutions, Inc., have joined forces to break down the problem and provide details on new lending programs and resources that can help your students today. Ivy makes artificially intelligent self-service chatbots for higher education. Support greater information flow by providing 24/7 coverage unencumbered by hours of operation and personnel availability. Bot-ify your department with the latest AI-powered chatbots for websites, text messaging, email and Facebook messenger.